Join this highly useful bus transfer to travel directly from Keflavík International Airport to the world-renown Blue Lagoon Spa, a hot pool complex that draws visitors from across the world. This is the perfect opportunity for those travellers looking to relax immediately after their flights, getting straight into the holiday spirit with a luxurious soak in the lagoon's azure waters. After spending some time in the warm, milky-blue waters of the Blue Lagoon, you can then take a bus onwards to Reykjavík and be dropped off at a designated drop-off point near your hotel or guesthouse. This not only makes the process of getting to your accommodation a piece of cake, it also means that you'll have the opportunity to enjoy a relaxing and authentically Icelandic experience in between the legs of travel. It's easy to see why the Blue Lagoon spa is so popular amongst locals and international visitors alike, and that's just given the sheer aesthetic of the place. Aside from the glorious temperature of the water, the lagoon is surrounded by a plethora of gorgeous nature, from volcanic hillsides to distant mountains, and silica mud, proven to possess healing qualities beneficial for the skin. Plus, there is always the opportunity for a massage, a face mask or even a bite to eat at the Blue Lagoon's accompanying bistro. Please note that the entrance ticket to the Blue Lagoon is not included and that you need to pre-book it in advance. It is better to do this in a timely manner as the lagoon is very popular and places are competitive. Make sure to avoid any disappointment on arrival by having your entrance tickets book well in advance. So what's the delay? Make sure to unwind in the azure waters of the Blue Lagoon as soon as you arrive in Iceland and beat off the jetlag. Check availability by choosing a date. Pickup time : 07:30, 08:30, 11:30, 15:30, 16:30. Please meet your bus outside the terminal building. This worked out great for us. We arrived at KEF very early in the morning but couldn't check into our hotel until late in the afternoon, so we appreciated this bus transfer that took us to Blue Lagoon and then later to our hotel. There were safe places to lock our luggage, and lockers inside to store other belongings. At the recommendation of other reviewers, we did stop at the desk for Reykjavik Excursions in the airport at KEF to trade our voucher for a ticket, and they also gave us the schedule for the second bus transfer. It was convenient that we could just show up and get on any of the scheduled buses to Reykjavik when we were ready. The guide was friendly and informative. The sites were all really amazing. I would advise the small group tour if you don't want to be in a massive group of tourists. The small group made it feel less like the guide was herding cattle. All the logistics worked out smoothly. I traveled with my 5 year old and my mother, the bus was comfortable and timely. The staff was pleasant and made sure we were on the proper buses from the airport to the Blue Lagoon and later to our hotel in Reykjavik! When you book this company, be aware to get your ticket from Reykjavik Excursions service desk after your flight lands! Perfect. Really easy to find the bus outside the airport. On time. And super experience at Blue lagoon. I strongly recommend. Easy, on-time transportation. Did not know we had to check in at the desk inside first-but I saw someone else do it, so we were ok! After arriving, get the ticket from the counter named "flybus" in the airport and the staff would tell u where to wait outdoor. Very Convenient, remember to arrange the time well. Well organized trip. The buses are good to find at the airport and at the bus stop near the blue lagoon. Would definitely book this transfer again. Smooth, timely, and fairly priced. Would recommend this transfer for anyone heading to/from the Blue Lagoon. Easy and convenient and with a reasonable price. Convenient transportation and nice driver! Easy transport to Blue Lagoon and then to Reykjavik. One tip...if you purchase your voucher on this site, you need to go to the Reykjavik Excursions desk to exchange the voucher for an actual ticket. Otherwise, this was a super convenient way to visit Blue Lagoon. The bus was on time and comfortable.Had difficulty finding the bus outside of the airport. The outside of the bus says Reykjavik Excursions, but my ticket and paperwork did not mention that at all. I had to go to the Flybus desk in the airport, where I was redirected to the Reykjavik excursions desk. They then told me which bus to walk to. When leaving the Blue Lagoon, the bus waited an extra few minutes for my friends, who were late. Perfect way to start our Iceland Adventure! Transport from the airport was easy, on time, clean and comfortable. The Blue Lagoon was absolutely fabulous and buses back to Reykjavik are throughout the day which was so convenient. Easy transport! Made it very relaxing! On time pick up & drop off. Great service! Very convenient way to get from the airport to the Blue Lagoon and then on to Reykjavik. Buses were timely, clean, safe. Highly recommend this transfer if you to stop for a dip after arriving and before heading on to the city. Buses were on time, comfortable and regular. I didn't need to get a ticket before, just waited for the bus arrival and show the confirmation email to bus driver and everything went smooth afterwards. Very easy! I would definitely do this agree next time we visit Iceland. This tour was amazing! My friend and I had a wonderful time on this tour. Our tour guide “Kevin” (sorry! Not sure how to spell out your actual name) was great! He shared some delicious snacks with us and told us some great stories and history. Definitely an amazing trip! Wonderful tour. Saw beautiful sights a great day would highly recommend. Fast and convenient transport service, staff are nice and helpful I recommend visiting the blue lagoon just after arrival to reykjavik or before departure, since the transport distance is much closer and the transport cost is much lower! Before you leave the airport, remember to pick up your ticket at the counter of the bus agency. Also the trip was very convenient and quick. The bus was on time and we were greeted nicely by the driver. Would totally recommend especially after a long flight . Cheap, easy and no-fuss transfer from airport to Blue Lagoon, and back to our accomodation. Well organized and efficient transfer service to the blue lagoon. We had to change our dates due to delayed flight and the company was very helpful and quick to respond. 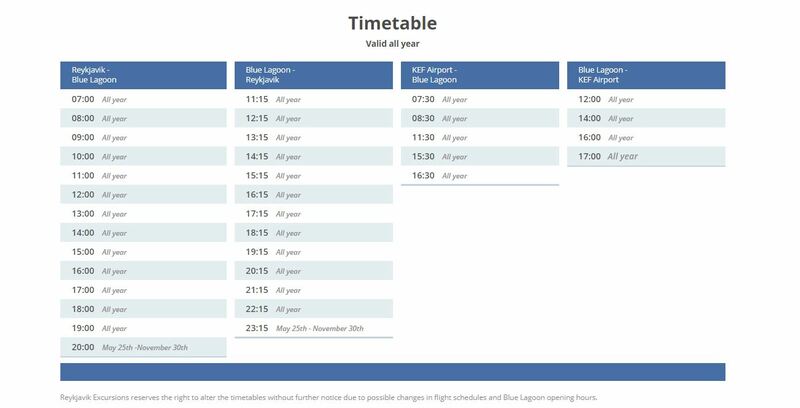 Very convenient and easy transfer from Keflavík-blue Lagoon-Reykjavik. This was a great way to start my trip. Blue Lagoon is approximately 20 minutes from the airport so being picked up and dropped off there was quick and a really relaxing start to the trip. Great ! Relaxing and ideal after a long flight. Once I figured out we were working with a mutinied of companies, things became much clearer. The Blue lagoon staff are much friendlier at the ticket counter than the coat room. The lagoon itself is super relaxing! Overall it was a great way to start the trip. It was a great idea to go to the Blue Lagoon directly to the airport. After a relaxing bath in the warm thermal water and a face mask all the stress from the trip was gone. This bus service was perfect to seize the day! Blue Lagoon is a great place where you can have a good relaxation after the long day of travelling. The ride from the airport to the Blue Lagoon went smooth. When I tried to board the bus from he Blue Lagoon to the hotel, the driver said I needed a ticket from the previous bus driver. Apparently the driver from the airport forgot to give me the ticket I needed, in addition to me not receiving an actual pdf ticket. I explained to him that the driver didn’t give me a ticket and showed him the email confirmation I received but he said he didn’t know what it was I was showing him. He said he needed the ticket or to see the PDF... both which I couldn’t show since I never received either. What I did have was an email showing the company name that would be picking me up and that I paid for the service. This was my first time to Iceland and this was a terrible first experience! He made it seem like I was trying to get a free ride because other people forgot to do their jobs correctly. I was so upset! After enjoying a relaxing g time at the Blue Lagoon, to be greeted by such a person was terrible! I emailed the company to inform them of what happened and they had the nerve to simply email me the PDF ticket that not only should’ve been sent to me weeks ago, but was hours past the time of my booking. They didn’t address the problem what so ever! I would never book with them again! If you want to be stranded freezing in a foreign country then this would be the way to go! I was shouted at by the pick-up bus driver. Firstly, the pick up bus was late 15 minutes which make me and my 4 year-old daughter wait in the middle of the wind. Then when we are finally on the pick-up bus, I make my complaint to the bus driver. Not until I finish my word the bus driver started the bus (we did even make our seat then). Then she suddenly hit on the brake and started shouting at us (we almost fell over). She basically said things like she had other customers to pick up so it is fair to let us wait, but there was no other customers on the bus except us. Plus, it should be the company to plan well on the schedule rather than letting the customers to suffer. Also, it is absolutely unacceptable to shout at the customer if they raise their feedbacks. It is not suppose to be a kind of company like this reputation to let their customers to have such a bad service experience. Overall, that driver completely ruined our day! !